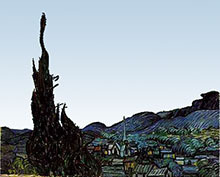 Paintings are all about light, especially in the time of Van Gogh. Starry Night is, of course, a night scene. But the foreground is not buried in darkness; it's really somewhat light. It's the sky that makes it a night scene. Look at the painting with a different sky. It's suddenly a daylight landscape, or at least an early-morning landscape. Van Gogh wanted stars in a night sky, and when he was finished they dominated the painting. Everything else is secondary. We can't look at it without our eyes going first to the giant stars, the crescent moon with its thick glow, and the richly textured sky. What was happening in the United States during the years when Van Gogh was painting his 900 paintings. For the first time, America produces more steel than Britain. John Pemberton invents Coca-Cola in Atlanta. Kodak introduces the first consumer camera. Hiram Maxim invents the machine gun. The Brooklyn Bridge is inaugurated in New York City. The first skyscraper is built in Chicago. Josephine Cochrane invents the dishwasher. Click on the book cover to buy this book. It's based on letters from Vincent to his brother Theo. The classic fictionalized biography, Lust for Life, by Irving Stone. The work of mad man? Van Gogh was a failure as an artist. With about 900 works to his credit, he sold only one during his lifetime. He was unsuccessful with romance and with various jobs. Just before painting Starry Night, he suffered a bout of epilepsy in which he chased a friend with an open razor. Van Gogh later sliced off a piece of his own ear lobe and offered it to a prostitute. He had periods of delusions and lucidity and was sent to an asylum in Saint-Remy for treatment. While there, in 1889, he created this work. He was still a young man of 36. He killed himself a year later, "for the good of all." We can infer that Van Gogh was certainly very troubled, but in examining the painting, we can't help but marvel at its logical structure. It looks chaotic, but it's really very orderly. The painting uses two primary colors, yellow (stars) and blue ( sky), to illustrate a starry night. Mix the two colors and you get the green of the village and surroundings. It's a two-color painting. The landscape is bright, but it's night. We can tell by the yellow lights in the windows--little splashes of light that balance the bright stars in the sky. This painting is all about balance, harmony, and repetition. The large cypress tree in the foreground should dominate the painting, but we're drawn to the other elements--the moon, the stars, the swirling sky, and the picturesque village. What's the purpose of the tree? It establishes perspective. It's definitely in the foreground. The village is in the middle ground, The mountains and sky are background. It's a beautiful setting, but we're not part of it. We're far away. It balances the dark shapes on the right, as well as counter-balancing the glowing crescent moon. It mirrors the church steeple. Both point upward to the vivid sky. The wavy, turbulent clouds mimic the sweeping hillsides, and they're like a heavenly figure plunging down from above with outstretched arm. Is this a threat or a protective spirit? The smooth, rolling hills are nothing like the craggy hills near the asylum. Van Gogh painted this from memory, not from direct observation. He took liberties with everything. The church, the houses, and the roads are blocky and geometric—the human side of the landscape played against God's landscape with its curves and ambiguities. In Van Gogh's mind, which part is chaos and which part is structured? 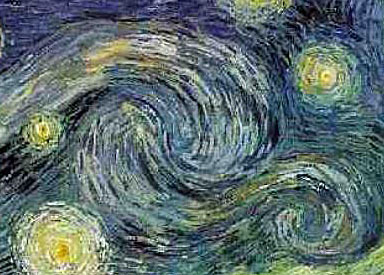 So was Van Gogh insane when he painted Starry Night? Some critics say his wild brush strokes and odd shapes indicate that he was a bit loony. I don't think so, Tormented and troubled, yes. Crazy, no! This painting is well planned and beautifully executed. I think he knew exactly what he was doing.